This representation is in parallel form. If all of Kp, Ki, Kd, and Tf are real, then the resulting C is a pid controller object. If one or more of these coefficients is tunable (realp or genmat), then C is a tunable generalized state-space (genss) model object. To choose different discrete integrator formulas, use the IFormula and DFormula properties. (See Properties for more information about IFormula and DFormula). If DFormula = 'ForwardEuler' (the default value) and Tf ≠ 0, then Ts and Tf must satisfy Tf > Ts/2. This requirement ensures a stable derivative filter pole. C = pid(sys) converts the dynamic system sys to a parallel form pid controller object. C = pid(Kp) creates a continuous-time proportional (P) controller with Ki = 0, Kd = 0, and Tf = 0. C = pid(Kp,Ki) creates a proportional and integral (PI) controller with Kd = 0 and Tf = 0. C = pid(Kp,Ki,Kd) creates a proportional, integral, and derivative (PID) controller with Tf = 0. C = pid(...,Name,Value) creates a controller or converts a dynamic system to a pid controller object with additional options specified by one or more Name,Value pair arguments. C = pid creates a P controller with Kp = 1. A real and finite value. An array of real and finite values. A tunable parameter (realp) or generalized matrix (genmat). A tunable surface for gain-scheduled tuning, created using tunableSurface. When Kp = 0, the controller has no proportional action. When Ki = 0, the controller has no integral action. When Kd = 0, the controller has no derivative action. Time constant of the first-order derivative filter. A real, finite, and nonnegative value. An array of real, finite, and nonnegative values. When Tf = 0, the controller has no filter on the derivative action. To create a discrete-time pid controller, provide a positive real value (Ts > 0). pid does not support discrete-time controller with unspecified sample time (Ts = -1). Ts must be a scalar value. In an array of pid controllers, each controller must have the same Ts. SISO dynamic system to convert to parallel pid form. sys must represent a valid PID controller that can be written in parallel form with Tf ≥ 0.
sys can also be an array of SISO dynamic systems. Use Name,Value syntax to set the numerical integration formulas IFormula and DFormula of a discrete-time pid controller, or to set other object properties such as InputName and OutputName. For information about available properties of pid controller objects, see Properties. PID controller, represented as a pid controller object, an array of pid controller objects, a genss object, or a genss array. If all the gains Kp, Ki, Kd, and Tf have numeric values, then C is a pid controller object. When the gains are numeric arrays, C is an array of pid controller objects. The controller type (P, I, PI, PD, PDF, PID, PIDF) depends upon the values of the gains. For example, when Kd = 0, but Kp and Ki are nonzero, C is a PI controller. If one or more gains is a tunable parameter (realp), generalized matrix (genmat), or tunable gain surface (tunableSurface), then C is a generalized state-space model (genss). The Kp, Ki, and Kd properties store the proportional, integral, and derivative gains, respectively. Kp, Ki, and Kd are real and finite. The Tf property stores the derivative filter time constant of the pid controller object. Tf is real, finite, and nonnegative. 'ForwardEuler' — IF(z) = Tsz−1. This formula is best for small sample time, where the Nyquist limit is large compared to the bandwidth of the controller. For larger sample time, the ForwardEuler formula can result in instability, even when discretizing a system that is stable in continuous time. 'BackwardEuler' — IF(z) = Tszz−1. An advantage of the BackwardEuler formula is that discretizing a stable continuous-time system using this formula always yields a stable discrete-time result. 'Trapezoidal' — IF(z) = Ts2z+1z−1. An advantage of the Trapezoidal formula is that discretizing a stable continuous-time system using this formula always yields a stable discrete-time result. Of all available integration formulas, the Trapezoidal formula yields the closest match between frequency-domain properties of the discretized system and the corresponding continuous-time system. When C is a continuous-time controller, IFormula is ''. 'ForwardEuler' — DF(z) = Tsz−1. 'BackwardEuler' — DF(z) = Tszz−1. 'Trapezoidal' — DF(z) = Ts2z+1z−1. The Trapezoidal value for DFormula is not available for a pid controller with no derivative filter (Tf = 0). When C is a continuous-time controller, DFormula is ''. Time delay on the system input. InputDelay is always 0 for a pid controller object. Time delay on the system Output. OutputDelay is always 0 for a pid controller object. Sample time. For continuous-time models, Ts = 0. For discrete-time models, Ts is a positive scalar representing the sampling period. This value is expressed in the unit specified by the TimeUnit property of the model. PID controller models do not support unspecified sample time (Ts = -1). Changing this property does not discretize or resample the model. Use c2d and d2c to convert between continuous- and discrete-time representations. 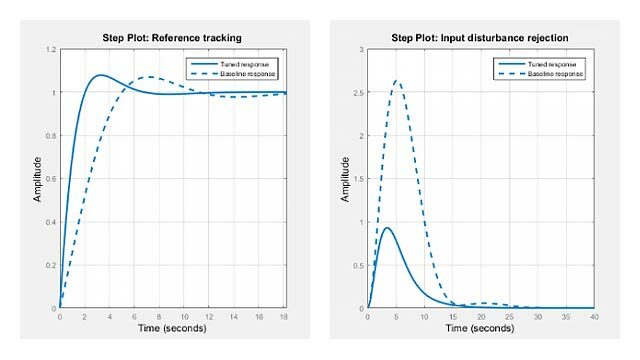 Use d2d to change the sample time of a discrete-time system. Changing this property has no effect on other properties, and therefore changes the overall system behavior. Use chgTimeUnit to convert between time units without modifying system behavior. Input channel name, specified as a character vector. Use this property to name the input channel of the controller model. For example, assign the name error to the input of a controller model C as follows. You can use the shorthand notation u to refer to the InputName property. For example, C.u is equivalent to C.InputName. Input channel units, specified as a character vector. Use this property to track input signal units. For example, assign the concentration units mol/m^3 to the input of a controller model C as follows. InputUnit has no effect on system behavior. Input channel groups. This property is not needed for PID controller models. Output channel name, specified as a character vector. Use this property to name the output channel of the controller model. For example, assign the name control to the output of a controller model C as follows. You can use the shorthand notation y to refer to the OutputName property. For example, C.y is equivalent to C.OutputName. Output channel units, specified as a character vector. Use this property to track output signal units. For example, assign the unit Volts to the output of a controller model C as follows. OutputUnit has no effect on system behavior. Output channel groups. This property is not needed for PID controller models. System name, specified as a character vector. For example, 'system_1'. Any type of data you want to associate with system, specified as any MATLAB® data type. Sampling grid for model arrays, specified as a data structure. For model arrays that are derived by sampling one or more independent variables, this property tracks the variable values associated with each model in the array. This information appears when you display or plot the model array. Use this information to trace results back to the independent variables. Set the field names of the data structure to the names of the sampling variables. Set the field values to the sampled variable values associated with each model in the array. All sampling variables should be numeric and scalar valued, and all arrays of sampled values should match the dimensions of the model array. For example, suppose you create a 11-by-1 array of linear models, sysarr, by taking snapshots of a linear time-varying system at times t = 0:10. The following code stores the time samples with the linear models. Similarly, suppose you create a 6-by-9 model array, M, by independently sampling two variables, zeta and w. The following code attaches the (zeta,w) values to M.
When you display M, each entry in the array includes the corresponding zeta and w values. For model arrays generated by linearizing a Simulink® model at multiple parameter values or operating points, the software populates SamplingGrid automatically with the variable values that correspond to each entry in the array. For example, the Simulink Control Design™ commands linearize and slLinearizer populate SamplingGrid in this way. Create a continuous-time controller with proportional and derivative gains and a filter on the derivative term. To do so, set the integral gain to zero. Set the other gains and the filter time constant to the desired values. Continuous-time PDF controller in parallel form. The display shows the controller type, formula, and parameter values, and verifies that the controller has no integrator term. Create a discrete-time PI controller with trapezoidal discretization formula. To create a discrete-time PI controller, set the value of Ts and the discretization formula using Name,Value syntax. Discrete-time PI controller in parallel form. Alternatively, you can create the same discrete-time controller by supplying Ts as the fifth input argument after all four PID parameters, Kp, Ki, Kd, and Tf. Since you only want a PI controller, set Kd and Tf to zero. The display shows that C1 and C2 are the same. When you create a PID controller, set the dynamic system properties InputName and OutputName. This is useful, for example, when you interconnect the PID controller with other dynamic system models using the connect command. Continuous-time PID controller in parallel form. The display does not show the input and output names for the PID controller, but you can examine the property values. For instance, verify the input name of the controller. Create a 2-by-3 grid of PI controllers with proportional gain ranging from 1–2 across the array rows and integral gain ranging from 5–9 across columns. To build the array of PID controllers, start with arrays representing the gains. When you pass these arrays to the pid command, the command returns the array. 2x3 array of PID controller. Each PID has 1 output and 1 input. Alternatively, use the stack command to build an array of PID controllers. These commands return a 1-by-2 array of controllers. 1x2 array of PID controller. All PID controllers in an array must have the same sample time, discrete integrator formulas, and dynamic system properties such as InputName and OutputName. Convert a standard form pidstd controller to parallel form. Standard PID form expresses the controller actions in terms of an overall proportional gain Kp, integral and derivative time constants Ti and Td, and filter divisor N. You can convert any standard-form controller to parallel form using the pid command. For example, consider the following standard-form controller. Convert this controller to parallel form using pid. Convert a continuous-time dynamic system that represents a PID controller to parallel pid form. The following dynamic system, with an integrator and two zeros, is equivalent to a PID controller. Create a zpk model of H. Then use the pid command to obtain H in terms of the PID gains Kp, Ki, and Kd. Convert a discrete-time dynamic system that represents a PID controller with derivative filter to parallel pid form. Create a discrete-time zpk model that represents a PIDF controller (two zeros and two poles, including the integrator pole at z = 1). When you convert sys to PID form, the result depends on which discrete integrator formulas you specify for the conversion. For instance, use the default, ForwardEuler, for both the integrator and the derivative. Discrete-time PIDF controller in parallel form. Now convert using the Trapezoidal formula. The displays show the difference in resulting coefficient values and functional form. For this particular dynamic system, you cannot write sys in parallel PID form using the BackwardEuler formula for the derivative filter. Doing so would result in Tf < 0, which is not permitted. In that case, pid returns an error. Discretize a continuous-time PID controller and set integral and derivative filter formulas. Create a continuous-time controller and discretize it using the zero-order-hold method of the c2d command. The display shows that c2d computes new PID gains for the discrete-time controller. The discrete integrator formulas of the discretized controller depend on the c2d discretization method, as described in Tips. For the zoh method, both IFormula and DFormula are ForwardEuler. If you want to use different formulas from the ones returned by c2d, then you can directly set the Ts, IFormula, and DFormula properties of the controller to the desired values. However, these commands do not compute new PID gains for the discretized controller. To see this, examine Cdis2 and compare the coefficients to Ccon and Cdis1. Create a pid controller object from known PID gains and filter time constant. Convert a pidstd controller object to a standard-form pid controller object. Convert other types of dynamic system models to a pid controller object. To design a PID controller for a particular plant, use pidtune or pidTuner. To create a tunable PID controller as a control design block, use tunablePID. In an array of pid controllers, each controller must have the same sample time Ts and discrete integrator formulas IFormula and DFormula. Use the c2d command. c2d computes new parameter values for the discretized controller. The discrete integrator formulas of the discretized controller depend upon the c2d discretization method you use, as shown in the following table. For more information about c2d discretization methods, see the c2d reference page. For more information about IFormula and DFormula, see Properties . If you require different discrete integrator formulas, you can discretize the controller by directly setting Ts, IFormula, and DFormula to the desired values. (See Discretize a Continuous-Time PID Controller.) However, this method does not compute new gain and filter-constant values for the discretized controller. Therefore, this method might yield a poorer match between the continuous- and discrete-time pid controllers than using c2d.